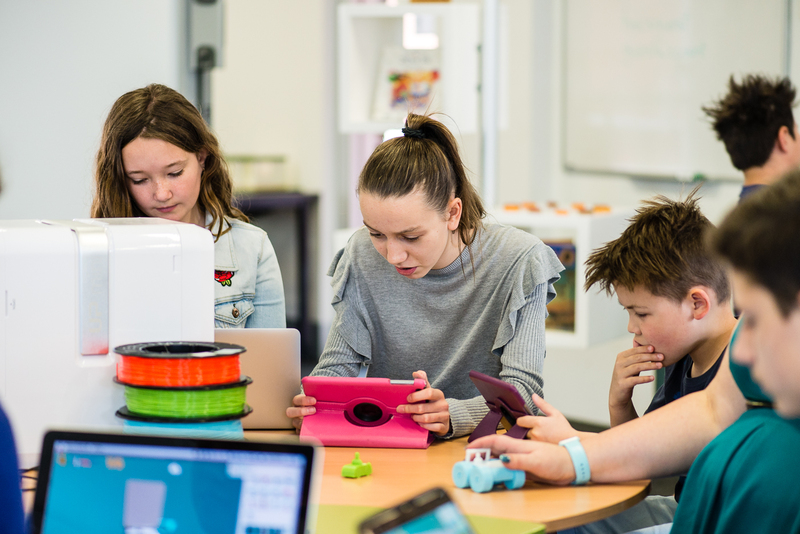 I am becoming increasingly convinced that maker pedagogy has the power to develop critical, creative and design thinking, and the creative confidence and self-belief our young people need to become innovators, problem-solvers and positive change makers. I can often be heard sprouting the virtues of constructionist learning theory. Occasionally, I am pulled up on this point and asked if I meant to say constructivist learning theory. Sometimes, I’ve even caught a glimpse of a slightly smug expression, waiting for me to admit my mistake. So, did I really mean constructivism? Well, the answer is yes and no. Constructivist learning theory, developed by Piaget, describes learning as a meaning-making endeavour, where learners construct their own knowledge and understandings by building on and connecting to their existing knowledge and understandings. Seymour Papert, as a student of Piaget’s, took constructivist learning theory one step further to say that learners make deeper connections and understandings if part of the learning process involves active and purposeful construction. By articulating constructionist learning theory, Papert highlights the role that the physical act of making plays in learning. From his early work, Papert went on to describe what constructionism looks like in practice. He called this approach ‘maker pedagogy’. So how do you spot maker pedagogy? Sure, you’ll see students busily making and constructing using a range of materials, but it’s more than that. You’ll see students engaged in hands-on activities, manipulating concrete and digital materials and physically constructing purposeful creations. Rather than being solely a tool for consuming information, we can also view technology as a building material. A maker pedagogy approach includes a range of traditional construction materials but also embraces the unique properties that digital tools such as 3D modelling software can afford. You’ll notice students using digital tools as building materials that replace or complement traditional materials and methods and also allow them to make structures that would be impossible without the digital tools. The focus is on how to be the best learner you can be, as well as developing a deep understanding of curriculum content. You’ll see students trying different approaches, reflecting and discussing their learning experiences as they hone strategies and develop awareness and understanding of how they learn best. You’ll observe students being stretched, moving out of their comfort zones and having hard fun. You’ll see students failing well, by making and testing prototypes, analysing their failures and producing improved iterations of their designs. You’ll notice persistence, resilience and optimism. You’ll notice that students have time to make plans, fail at plans, make new plans, and are held accountable for how they manage their time. You’ll see teachers learning alongside their students, thinking aloud, modelling learning behaviours and engaging authentically as lifelong learners. You’ll notice students working in pairs and small groups as well as individually. Students will be discussing their ideas, helping each other, engaging in rich dialogue and debates, and sharing their skills and resources. You’ll also notice students being encouraged to participate as members of a global society by communicating with people from around the world and using technology to make connections and build on their learning. At Makers Empire, we help teachers embed making as an integral part of their teaching practice. Our easy to use 3D modelling software provides the perfect tool for students to create anything they can imagine and to complement traditional construction materials. Our tools and resources are used by teachers to engage students in purposeful design-based learning, where they work collaboratively, manage their time and projects, and respond to failure by evaluating and iterating their designs. Together, we can help our young people prepare for a future where their ability to identify problems, develop innovative solutions and respond to setbacks with creative confidence, will see them survive, thrive and drive change for a better world. Mandi Dimitriadis, DipT. is the highly regarded and passionate Director of Learning at Makers Empire. She is an experienced classroom teacher who recognises the power of technology to enhance teaching and improve educational outcomes. Mandi has extensive experience with curriculum development and learning, having previously developed programs for the Australian Government’s Department of Education. She is passionate about Design Thinking and how best to prepare today’s students for the future.